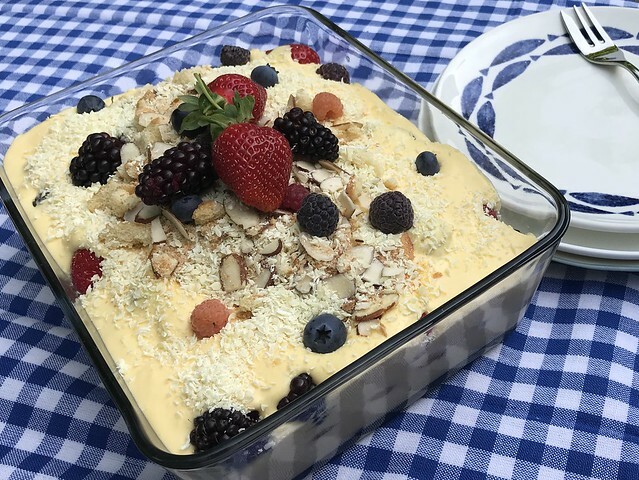 Tiramisu, Italy’s version of English Trifle, is usually flavoured with coffee and chocolate however I have taken a fruity approach to create a summery dessert to suit our Southern Hemisphere climate. I made a Lemon & Raspberry version however the Lemon & Mixed Berry version is more suitable if you have a berry patch out the back like I do. I have all sorts of berries ripening but usually just a handful or two of each – not 2 1/2 cups worth (yet – maybe next year). 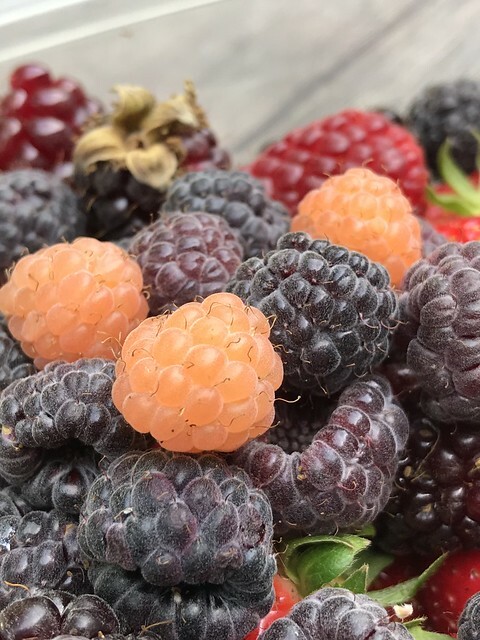 I have used blueberries, strawberries, boysenberries, raspberries (red, ebony (black) and ivory (white)), as well as all the different hybrid berries we are growing (loganberries, tayberries, berry delight, ranui berries and aurora berries). The larger berries I have cut in half or smaller so they don’t poke up out of the sabayon too much. I have also made this tiramisu with both stale trifle sponge and the Savoiardi. I prefer the sponge finger biscuits as they hold their shape a little better for longer. I haven’t yet attempted to make my own sponge finger biscuits but only because I was a little pushed for time. 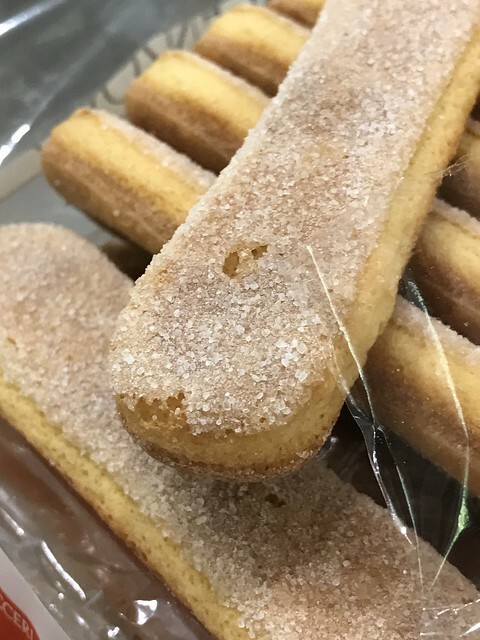 Having made 6 tiramisu in the last couple of weeks, I would like to try making my own sponge finger biscuits so I don’t have to keep traipsing down to the store to buy yet another packet of sponge finger biscuits. To use a trifle sponge – leave it out set on a cake rack so it dries out. This will help it disintegrating into a pile of Limoncello flavoured mush. Use any remaining Limoncello tea syrup to make a delicious punch or add some gelatine and set it into a shallow dish. I added an extra teaspoon of gelatine so it is a firm set then cut the jelly into squares and store it in the fridge – Mr L likes to have one or two squares with his morning tea snack. As this dessert has fresh berries, it is best eaten on the day it is prepared and any leftovers cleaned up the following day. Heat the water, lemon zest, juice and white sugar together over medium heat, stirring, until the sugar is dissolved. Bring to a boil, boil for five minutes then remove from the heat. Add the tea bag and set aside to cool. Remove the tea bag and stir in the first measure of Limoncello. Set aside until required. Makes about 1 cup. Whisk egg yolks in a heat-proof bowl. Set over a bain-marie or double boiler. While whisking (with an electric hand mixer) add sugar and Limoncello gradually, beating all the while making sure the water is on a very low heat (a bare simmer). Beat until the mixture is thick, foamy and a pale lemon colour (about 10 minutes). Remove from the heat and place in a cold-water bath and continue beating until the mixture is cool. Whip the cream until soft peaks form in a clean bowl. Gently fold the cream and the mascarpone into the egg mixture. Once all incorporated, cover and chill until required. Soak the Savoiardi or stale sponge pieces in the Limoncello tea syrup for a couple of seconds then place in a single layer in a 20 x 15 cm serving dish, trimming biscuits if needed. Add 1 ½ cups of fresh berries. Spoon over half the custard (about 2 ½ cups). Place another layer of soaked Savoiardi then repeat with another 1 ½ cups berries and custard. Cover and chill until ready to serve. To serve, garnish with crumbled remaining Savoiardi biscuits, extra fresh berries, sliced almonds and finely grated white chocolate. Note: in attempt to reduce the dairy content of the Tiramisu, I also made a version that used whipped egg whites instead of the whipped cream. To do this, reduce the amount of sugar whisked into the egg yolks by 1/4 and set it aside. Once the egg yolks and sugar are whisked together and cooled, whisk in the drained yoghurt (see below). In another bowl, whisk the egg whites until soft peaks form, then whisk in the sugar set aside when making the egg yolk mixture. Fold the whipped egg whites into the egg yolk mixture, gently incorporating the two mixtures until combined. Cover and store in the fridge until required. Occasionally, the sabayon may separate a little – just fold together gently again before layering up the dessert. I also replaced the mascarpone with drained yoghurt (or yoghurt cheese as it is sometimes called). As my dairy-intolerant daughter can tolerate yoghurt, I just used a natural unsweetened yoghurt however if all dairy is an issue – I suggest draining a non-dairy yoghurt such as coconut milk yoghurt. To drain yoghurt, place a sieve over a bowl. Rinse a clean cheesecloth and place it in the sieve. Scoop the yoghurt out into the sieve, cover it with a loose cover or a second cheesecloth. Set aside and leave to drain for about 4-5 hours (it can be placed in the refrigerator to drain also). Once the yoghurt is thick and of a consistency similar to cream cheese or mascarpone, it is ready to use as you would either of those products. The liquid that has drained out is whey and can be used in baking. 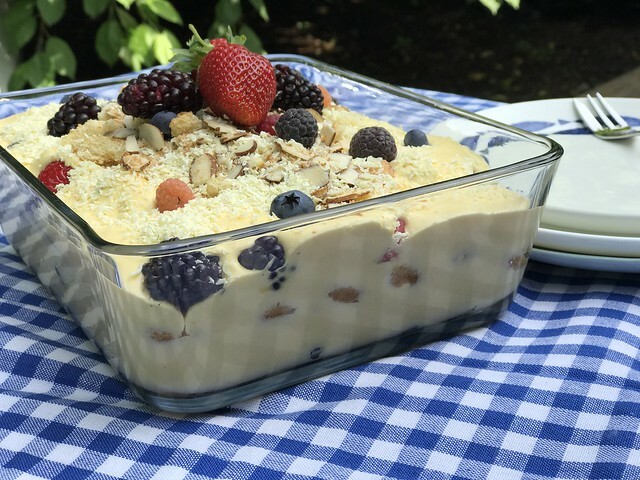 This entry was posted in Dessert, Savour, Seasonal, Summer and tagged Lemon & Berry Tiramisu, Limoncello, Saviordi, Savour, Tiramisu by Jo Dohrman. Bookmark the permalink.